...some wear colourful branded t-shirts. With the dawn of 2018, preparations for the twelfth Flatpack Film Festival have well and truly stepped up a gear and, as the main event in April draws ever closer, we are now recruiting more fantastic volunteers for Flatpack 12. This year, alongside our usual general volunteer roles, we are offering prospective volunteers the chance to tailor and vary their experience as there are several different areas that they can apply to work within. These vital volunteer roles are: Runners - providing production support during the festival. Marketing - contributing to social media coverage, writing blog posts and helping in the essential promotion of the festival both prior to and during the events. Colourbox - helping to make our younger visitors feel welcome and supporting the running of interactive workshops and activities. 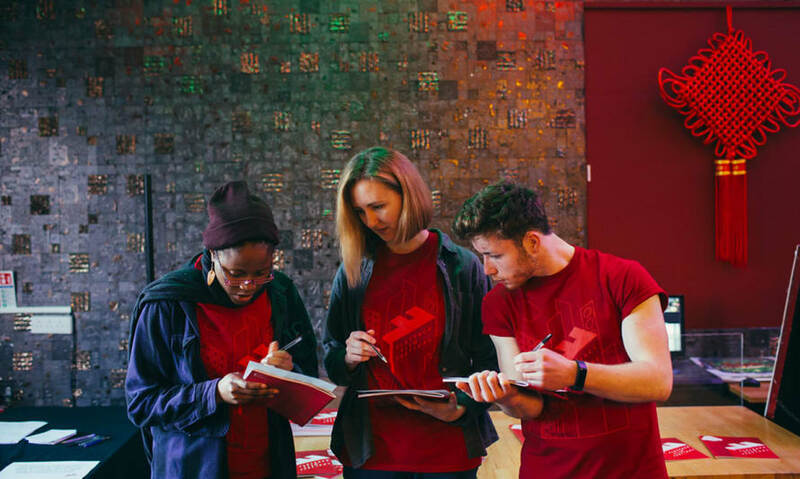 Back Office - for volunteers who have some time available prior to the festival as well as during, there is the possibility to support the Flatpack team in the office with box office ticketing, guest liaison and other vital operational/administrative tasks. Student Ambassadors - helping to promote the festival on campus by distributing marketing materials and generally raising awareness. The deadline to apply to become a Flatpack volunteer is Friday 2nd March 11:59 pm. You must be available to attend our volunteer orientation event on Saturday 31st March. Please note, this session is compulsory and if you are unable to attend you cannot volunteer for this year’s festival. Finally, all volunteers are required to commit to a minimum of 3 shifts during the 10 day festival (13th-22nd April). Therefore, if you are not available for at least three shifts across these dates, we may not be able to accept you into this year’s festival cohort. Without a doubt, the festival would struggle to run each year without the small army of passionate, friendly and talented individuals who give up their precious time to help deliver our events. If you would like to join the ranks, gain some invaluable, CV enhancing experience, connect with our grand old second city, generally have a great time and get your mitts on a rather dashing looking t-shirt then give us a bell.